The New Year’s Eve gala at the Met ushering out 2011 was the world premiere of the much-anticipated mash-up The Enchanted Island AKA “baroque opera for those who hate (or at least don’t know) baroque opera.” One hardly knows what to make of what occurred onstage Saturday night: mostly rare and ravishing 18th century gems moderately well sung by a big, mostly young cast within a largely witless, needlessly complicated ersatz-Shakespearian frame. Under William Christie’s vibrant conducting, only Joyce DiDonato and Luca Pisaroni had the necessary star power and stylistic command to truly transcend their arch surroundings. Yet it all somehow turned out to be a modestly entertaining enterprise—almost despite itself. Wanting to take advantage of the vogue for 18th century opera but apparently not trusting it much, Met General Manager Peter Gelb dreamed up the idea of a 21st century pasticcio that would bring together great pieces from the repertoire in a fizzy new English libretto. He told The New York Times: “I wanted to play the Baroque card, but with a faster dramatic rhythm tailored to modern attention spans.” With a 95-minute first act (longer than nearly any single act in all baroque opera) followed by one of 80 minutes, one wonders how this evolved into such a leaden concoction rather than the intended soufflé. While it is very true that such pastiches were common during the 18th century, a writer of that time noted that such works must be “prepar’d by a Person that is capable of uniting different Styles so artfully as to make ’em pass for one.” Unfortunately the Met wasn’t lucky enough to find such an ingenious cobbler. Instead, Jeremy Sams provided a flat-footed mélange of two great Shakespeare masterpieces The Tempest and A Midsummer Night’s Dream set to music by no fewer than eight composers, most prominently Handel, Vivaldi and Rameau. To create new words for some of the Bard’s most beloved characters must be a challenge for anyone, but Sams’s silly new plot set to reams of doggerel makes one wonder if he really knows his Shakespeare, much less his Dryden (author of another, superior Tempest knockoff). Somewhat baffling was the choice of musical numbers; rather than cherry-pick the “greatest hits,” there seems to have been a real effort to draw on lesser-known works, in particular by Handel. Mostly bypassing the over forty operas (and the hundreds of numbers they contain), Sams and his co-conspirators surprisingly chose primarily from early Italian oratorios like La Resurezzione and Il Trionfo del Tempo e del Disinganno (and the early chamber duets and cantatas), as well as from English oratorios like Susanna and Judas Maccabaeus. And when something was plucked from the operas, like Ariodante’s interrupted duet for soprano and mezzo, it was awkwardly transposed for soprano and tenor — then repeated over and over by several other pairs of lovers for comic effect. Meanwhile a perfectly ravishing duet written for soprano and tenor in Ariodante was ignored. More troubling was the constant juxtaposition of musically incompatible styles. For example toward the end of Act 1, Placido Domingo as the god Neptune lumbers through a long accompanied recitative based on Bajazet’s death scene from Handel’s Tamerlano, immediately followed by Pluton’s call (with chorus) for vengeance from the Hades scene of Rameau’s Hippolyte et Aricie, music of an entirely different tradition and style—the sudden shift is extraordinarily jarring. Apparently just any vocal music written during the first half of the 18th century might be thrown into this pot. These jolting transitions occur again and again throughout–connected by some of the most dreadful secco recitatives I have ever heard (presumably devised by Sams who lists “composer” among his many “talents”). I already had my doubts about his musical “credentials” after noting in the Met program his admiration for cantatas by Leclair (none of which survive) and his fondness for the music for Dryden’s Tempest composed by Purcell, when scholars have long since disputed Purcell’s hand in most of that music, including John Weldon’s great bass aria “Arise, ye subterranean winds” heard here inexplicably transposed up for a soprano Ariel. Given the hundreds of arias available, why wouldn’t every piece have been carefully selected to show off each singer’s best qualities? Instead, for example, an incredibly difficult soprano(!) aria from Vivaldi’s La Griselda was chosen and then transposed down for baritone, yet the Met’s Lysander huffed and puffed, displaying none of the required florid technique—but at least the aria was (mercifully?) relieved of its da capo repeat, as unfortunately were other numbers like the sprightly duet for Helena and Hermia from Handel’s Atalanta and Caliban’s stunning aria from Vivaldi’s Il Farnace. Thankfully the other three Midsummer characters were nicely sung by Layla Claire, Paul Appleby, and especially Elizabeth DeShong who was particularly vivid in her stab at Dejanira’s astonishing mad scene from Handel’s Hercules, a bizarre choice for the act two opener and one’s first glimpse of Hermia. For Rameau’s sublime quartet “Tendre amour” (one of the small glories of the French baroque) yet another four young singers were introduced, all decidedly unequal to the task. The show’s two countertenors formed an odd pair, one at the very beginning of his career, the other sounding like he was nearing the end of his. As Ferdinand, young Anthony Roth Costanzo, in only his second performance at the Met, was very much at home in the style but (based on this and other hearings) the voice remains not particularly attractive. The two Vivaldi pieces that began Prospero’s role found David Daniels in shockingly uneven form, but thankfully he began to pull it together with a wan rendition of the haunting “Pena tiranna” from Handel’s Amadigi. Ending the first part with that mournful aria seemed quite odd since the previous scene–the elaborate Neptune tableau–came to a really grand ending. His final aria, from Handel’s Partenope–one he recorded in 1999 and has sung many times, was Daniels’s best moment, but it was, however, a big mistake to have him speak the only real Shakespeare of the evening, Prospero’s “Our revels now are ended” speech. 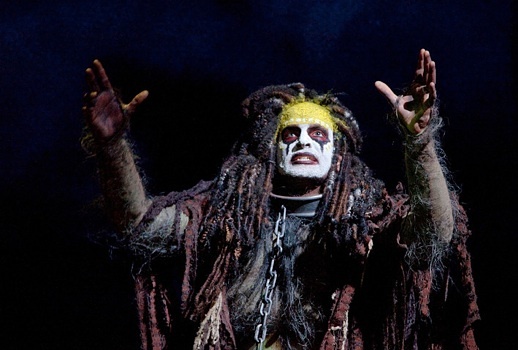 Towering over everyone were DiDonato and Pisaroni as Sycorax and her son Caliban. They were also luckily gifted with some of the finest music, particularly Pisaroni’s gorgeous aria from Handel’s final opera Deidamia and DiDonato’s second act pair: dazzling fireworks from Vivaldi’s Argippo then a meltingly beautiful section of Ferrandini’s “Il Pianto di Maria.” In those three moments alone, that special magic of baroque opera happened where a singer makes time stand still (sometimes for many minutes), and one was transported back to the early 18th century when great singers ruled (almost literally) the opera world. Having greatly admired Christie’s work with his own Les Arts Florissants since it brought Lully’s Atys to New York in 1989, I’m happy to report that this production displayed his talents far better than last year’s rather unfortunate revival of Mozart’s Cosi fan tutte. Although I suspect it was a big challenge to get the Met orchestra to conquer the new stylistic challenges of Vivaldi and the French baroque, it played beautifully for him, although one sometimes missed the more biting attack that period instruments would have brought to this music. The chorus, however, stumbled badly sounding at sea (and not just as Neptune’s subjects) and harkening back to the bad old pre-Palumbo days. Saddled with such a busy, lumbering scenario, one can scarcely blame the production team of Phelim McDermott and Julian Crouch that their work here didn’t show the inventiveness of their earlier projects: Satyagraha and the company’s 125th Anniversary Gala. The stage was framed by an ornate second proscenium, where on the left and right stairs led to doors representing the respective domains of Prospero and Sycorax, while much of the action then took place between those two worlds and where a curtain sometimes rose to show the a very effective shipwreck or the witty tableau of Neptune’s mermaid-filled underwater kingdom, or on which appeared some Disney-like projections representing Ariel’s increasingly inept spells. Despite all these serious reservations, the evening had many musical pleasures, mostly due to DiDonato, Pisaroni, Oropesa and Christie, but it could have been so much better. I don’t, for example, believe that a newly created pasticcio is inherently a bad idea—in fact I just heard a marvelous one in Krakow in early December: L’Oracolo in Messenia devised by Fabio Biondi. To be sure, that kind of serious effort was clearly not what Gelb had in mind, but I think a “crowd-pleasing” all-Handel or (especially) all-Vivaldi work featuring a star cast of some of the world’s best singers might have been created a frisson that the Met didn’t manage here. Occasionally I found myself thinking back to the MET’s big old mess of a Rinaldo from the 1980s which boasted Marilyn Horne (or Ewa Podles), Benita Valente, Carol Vaness and Samuel Ramey! On the other hand, I do think there are already existing works that might have been revived instead. In the early 1950s Rameau’s Les Indes Galantes was exhumed in Paris in a famously lavish production and proved so popular that it was put on more than 250 times in a decade. The more recent Andrei Serban Indes (available on DVD) again showed what an appealing work it is (and we heard a snippet of it at the Met during the masque for Caliban with Rameau’s ingenious dance music inspiring Graciela Daniele’s fanciful choreography). Even more provocative might have been importing José Montalvo and Dominique Hervieu’s production of Rameau’s Les Paladins which incorporates hiphop dance moves and spectacularly inventive use of video; this extraordinarily fun production unfortunately never made it to the US although it too is available on DVD. All these many caveats from a baroque-opera lover didn’t stop him from enjoying himself last evening, and the majority of the gala audience seemed to have had a roaring good time, although applause for the production team and particularly Sams was more tepid than the general enthusiasm for the cast and conductor. But then the question becomes: if The Enchanted Island (which is sui generis) becomes a hit and there’s a hunger for more, what does Gelb do for an encore?